Well, tomorrow is the big day. We are going to tackle the swing set. Holy cow....all 30,000 pieces!! It smells like a cedar forest in my garage! Nice smell, but I know what that smell means for me....HELL!!! This monstrosity will be put together in under 8 hours as far as I am concerned. That is my prediction. I am also predicting at the very least.....4 fights between Mike and I during its assembly. What can I say..nothing says married home improvement without a few fights. Just as a note...I am the analytical mind....I usually win construction fights! But, in my husband's defense...he wins the math and half of the common sense fights!! 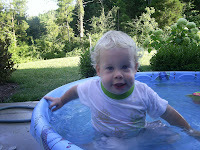 As I am writing this blog..Marshall is in the $12 Walmart pool on the patio fully clothed. He has been in and out of it since 4 o'clock when I brought him home. It is now 6:30p.m. Michael and I cheated and spent the entire day at a water park in McMinville, TN. Yes, I am a bad mommy. I dropped Marshall off at his daycare and Michael and I spent 5 hours at a waterpark. Do I feel guilty...maybe a little..but not too much to do it again!! Babies and waterparks mix like oil and water. Marshall will get his fair chance at the water park when he gets older. It is a priveledge!!! We are cooking hamburgers tonight...so....see ya later!! 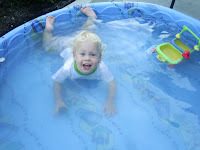 Here are some pics of Little Man in the baby pool fully clothed!